How do we write today? Skilfully, she swings her brush pen – the brush pen that is used for brush lettering – over the white premium paper. Her practised hand and her movements are gentle yet firm. The result can be visually appreciated: the ornately curved calligraphy is a feast for the eyes. You can tell right away that Christa-Maria Tobler knows what she’s doing. The lady from Berne has years of experience in brush lettering. 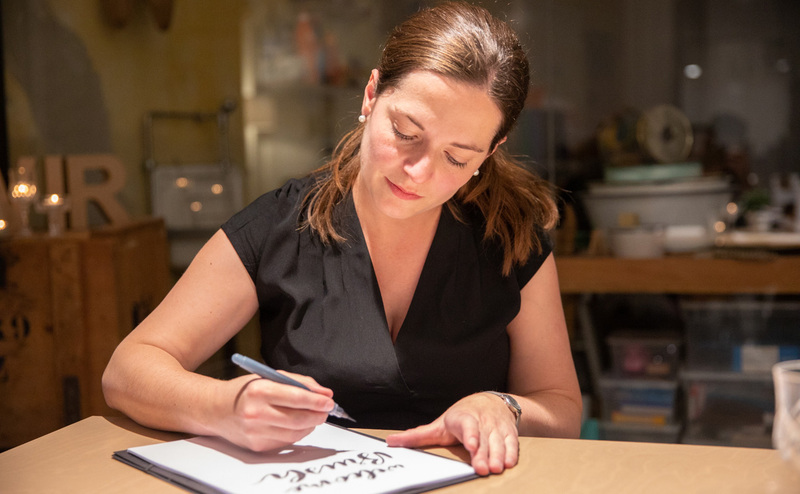 Although it was mere chance that originally introduced her to this art form, Christa-Maria describes calligraphy today as her great passion. And she’s more than happy to pass on her expertise, for example through workshops. Handwriting is back in fashion – and more than ever. On this cold December evening, 20 people gathered in the lovingly decorated creative room of the Kaffeebar & Coworking Space Effinger in the center of Berne to learn this craft. The workshop, which was organized and made possible by Swiss Post, was completely sold out in no time. And it’s no wonder: “I can take time for myself with brush lettering. I can relax, disconnect from everyday life and let my creativity run free”, says Christa-Maria. “Especially in our fast-paced lives it’s a great pleasure to be surprised with handwritten post. Finding such post in the letterbox is so precious.” The high demand shows: handwritten letters are more popular than ever. The attendees eagerly listen to the tips and tricks that the expert shares. The carefully designed room creates a cosy atmosphere, which also provides inspiration to the participants. Christa-Maria’s goal of the evening is, on the one hand, to transfer the flair for creativity and the joy she herself feels in brush lettering to the participants. On the other hand, she wants to teach them the technical basics. To that end, she first introduces them to the basic forms of brush lettering: squiggles, bows, and circular shapes that merge to form letters. 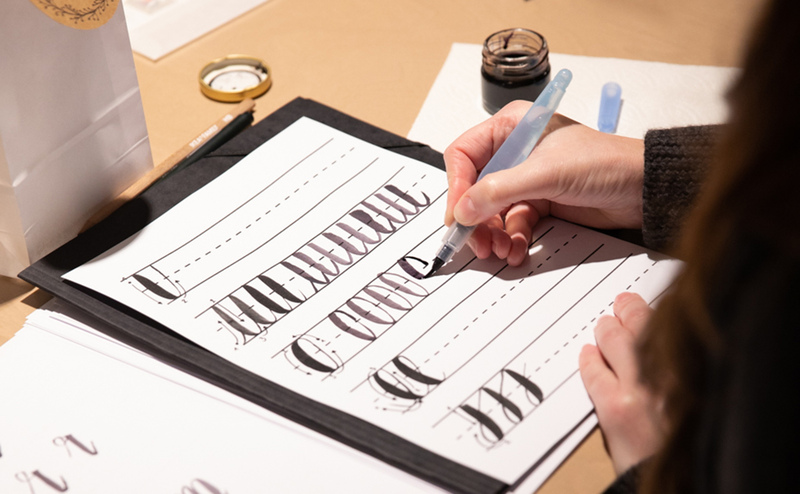 Gradually, the participants learn the whole brush lettering alphabet. “It’s as if I’m learning to write again”, says a participant jokingly. 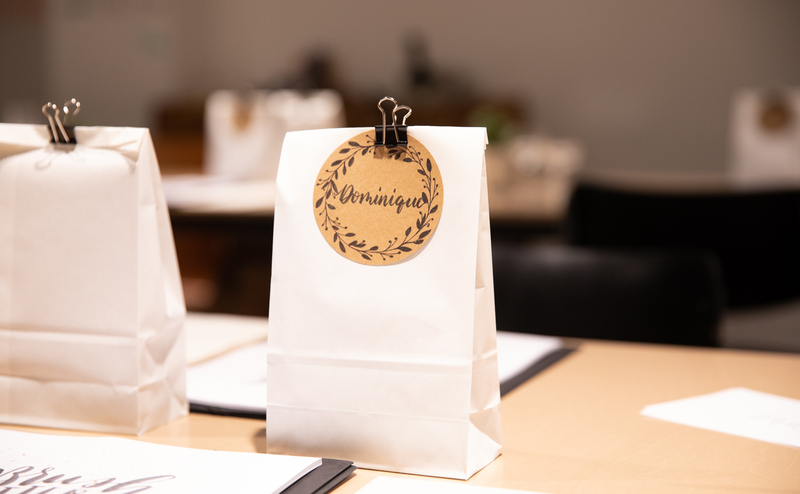 After receiving some instructions, the participants have the opportunity to take their first steps in brush lettering and to design their own personal cards – and to send them immediately to give their loved ones a special treat. The joy of the recipient will be even greater if the brush lettering mail has a beautiful stamp, giving the post an even more personal touch. For this reason, Swiss Post contributed matching stamps from the series “special occasions”, which are perfectly suited for brush lettering and even originated in the Effinger from the hands of the artist Claudine Etter. Although learning the technique is challenging, after the workshop happiness is written on the face of the participants. “I will definitely continue to practise and improve my technique. What Christa-Maria conjures up is fantastic”, says one of the participants. “I found a new hobby”, says another. The goal of this cosy evening has been reached and the excitement of producing creative work has been aroused. Brush lettering, a technique belonging to hand lettering, means writing using a brush or brush pen. Characteristic of the technique is the calligraphy effect, which is created by the interplay of thick and thin lines and brings the writing to life. The different thicknesses can be controlled according to the pressure exerted on the paper with the brush pen. If you want to become a brush lettering expert, you need practice: “It takes a while to master the craft”, says Christa-Maria. Otherwise, there are no requirements to become a brush lettering pro: anyone can learn the technique. For brush lettering, all you need is a brush pen (see here for a selection), as well as satin paper – and a bit of perseverance. A basic writing principle: various degrees of pressure are applied to achieve the calligraphy effect. The thin upward lines are drawn by pushing your brush pen with little pressure in an upwards motion. For the thick downward lines, move the brush pen with a lot of pressure from top to bottom. The tip of your brush pen should always have the same orientation. Unlike normal handwriting, brush lettering does not write a single word in one go. Instead, a word is drawn form by form and sometimes even letters are drawn in multiple steps. To achieve nice transitions between the thin and thick lines, slowly build them using up and down movements. Connections between the letters are always thin lines. Try to keep the spacing between the letters as constant as possible. And take your time. It pays to work slowly and precisely and to keep the letter shapes constant. Above all, brush lettering is a matter of practice: keep at it and do not give up if it does not happen right away. Get some inspiration from the pros, for example here. Brush lettering is ideal for giving special joy to special people. Sending a letter that was written using the brush lettering technique conveys a special appreciation and expresses the fact that you have taken time for someone. It’s time to send a letter or a card in lovingly crafted script.